Elizabeth Ludwig is the award-winning author of No Safe Harbor, Book One in the Edge of Freedom series. Her popular literary blog, The Borrowed Book, enjoys a wide readership. 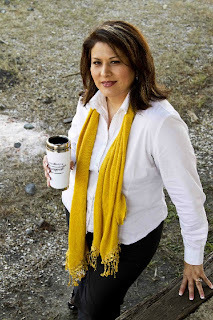 Elizabeth is an accomplished speaker and teacher, often attending conferences and seminars where she lectures on editing for fiction writers, crafting effective novel proposals, and conducting successful editor/agent interviews. Along with her husband and children, she makes her home in the great state of Texas. To learn more, visit ElizabethLudwig.com. Anyone who has ever tried their hand at writing knows—there are many highs and lows. I can still remember the extreme elation I felt the day I learned I’d sold my first book…and the despair I felt when I learned that the two subsequent books in the series would not be published. I remember the excitement I felt the day I signed with my dream agent, and the doubt I experienced when I realized that though I now had contracts and an agent, I would still receive rejections. Through all of that, the one thing that has remained constant, the one thing that has brought me hope in the midst of both joy and despair, has been the promise of God. The day I knew I was called to write, He shared a passage of scripture with me from Habakkuk 2:2-3 which states, 2 Then the Lord answered me and said: “Write the vision And make it plain on tablets, That he may run who reads it.3 For the vision is yet for an appointed time; But at the end it will speak, and it will not lie. Though it tarries, wait for it; Because it will surely come, It will not tarry. To this day, I would have to say the highlight of my writing journey has been receiving confirmation from the Lord that I was in His will. SS: As a professional writer, how do you juggle writing with other responsibilities and family? Oh my goodness…let me just say that dishes and laundry no longer carry the same importance! LOL! On top of writing fulltime, I’m also a fulltime secretary. Thankfully, I have a very supportive family, because when I’m on a deadline, I really need to call on them to step up and help with some of the things I normally do. SS: Tell us about the moment you finally felt like a “real author”? I think that would have to be the day I first saw one of my books in a book store. Talk about a thrill! It was really hard for me not to break into song and hold my book up like Rafiki in The Lion King. SS: Growing up, what books and authors did you love most? When I was younger, I loved to read fantasy—things that included magic, or fairies, or damsels in distress. One of my favorites was a small children’s book called No Flying in the House by Betty Brock. The book is about a child named Annabel Tippens. Annabel is a little girl “with short blond hair and very good manners” (taken from the book description on Amazon.com/No Flying in the House by Betty Brock). She seems quite ordinary, except that she’s also half fairy—and instead of parents, she has a two-inch high dog named Gloria. Well, you can imagine that for a kid who loved to read, this book was extraordinary. I read it over and over again, and dreamed of the day I would learn to fly. When I got into my teen years, it was more about the romance (imagine that) and history. I read A LOT. I guess that carried over because now, my favorite books are usually books with history, romance, and of course, a bit of suspense. SS: Tell us about your specific brand of suspense? My brand of suspense is a little different than most, in that I took a chance by combining it with historical fiction. Normally, readers looking for suspense tend toward contemporary fiction, but I noticed while I was preparing my series idea that year after year, Historical Romance placed very high on editor’s acquisitions lists. Fans of this genre tend to be very loyal. They clamor for books that whisper of a bygone era, when life was hard but uncluttered and people cared for themselves and one another. With that in mind, I worked on crafting a series that could only be called Historical Romantic Suspense. Combining these enduring genres is not a concept I created. It began with authors like Victoria Holt and Phyllis A. Whitney. I believe there is a strong audience for readers seeking books that mingle the search for love and hope, with danger and intrigue. SS: In addition to becoming a writer, what other dreams do you hope to accomplish in your life? ble blaze, and years later she still struggles with her anger at God for letting it happen. SS: What’s the story’s takeaway? SS: Now let’s get a little personal. When you have the chance to relax and enjoy life, what do you do? Well, let’s see…aside from reading and writing, I love to ski, and I have a ridiculous number of dogs. Someday, I’ll write a book about my life and call it Downhill Dachshunds: Keeping up with the Pack. SS: If you were a billionaire, what kind of charity or foundation would you start? At one time, my husband and I worked in Youth Ministry together, and I still remember how much I wanted to help those students come to a real and lasting faith in Jesus Christ. If I were a billionaire, I think I would want to start some kind of youth organization/outreach that ministered to the lost and un-churched students in my area. I have a website at www.elizabethludwig.com and a blog at www.theborrowedbook.blogspot.com, but my favorite place to connect is still on facebook. I hope you’ll stop by! SS: What advice would you give aspiring writers? I have tried to learn something from every manuscript I’ve ever written, whether they were published or not. From my historicals, I’ve learned how important it is to research every detail of my story, from the fabrics women wore to the building materials that were in use. With my mysteries, I learned the techniques for creating tension and planting clues. I guess my advice to aspiring writers is this…never stop learning. No matter what genre you’re in, be teachable, because more than anything else, writing is a job. Only those who are willing to work the hardest will be successful. Great advice! And wonderful interview. You have a delightful voice! Elizabeth is giving away a copy of her book! Please leave a comment with your contact information to be placed in the drawing. I've been a fan of Elizabeth's since the first time I heard her speak. I would love to add this book to my collection. 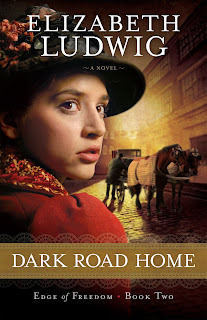 I can't wait to get my hands on Dark Road Home. Lovely interview here! Aww...thanks, Lill! Where have we met? Your book sounds so interesting! Thanks for the chance to win it. Thank you, Brittany! Good luck in the drawing. Historical Romantic Suspense sound like a perfect combination! I look forward to reading the EDGE OF FREEDOM series. Thank you for taking the time to share your interview and for the opportunity to win a copy of your book! Good luck in the drawing. Thanks for stopping by. Just finished No Safe Harbor and Dark Road Home and absolutely LOVED both of them! Loved the characters, the time period, the location... :) Eagerly anticipating the third one! Thanks for playing, Wilani! Best of luck in the drawing. Thanks, Jan! Good luck in the drawing. I am so excited to read this book. Thanks for the giveaway! Thank you, Paula! Good luck. Book sounds good. The interview was very interesting. Thanks, Pen! Best of luck in the drawing. Thanks for stopping by, Libby! Good luck. It was my pleasure! Thanks for stopping by. Love learning about new authors! Great interview. Thank you! Good luck in the drawing. Enjoyed your interview! Book sounds wonderful! Please enter me in the giveaway. Thank you!